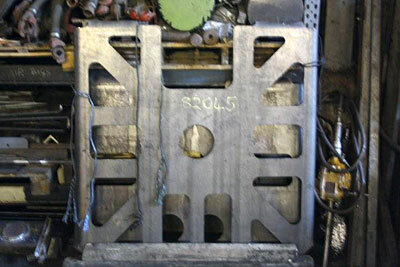 December saw a number of very productive working parties at Bridgnorth, with no less than eight Fund members engaged variously in machining, welding, cleaning down and painting frame stretchers. 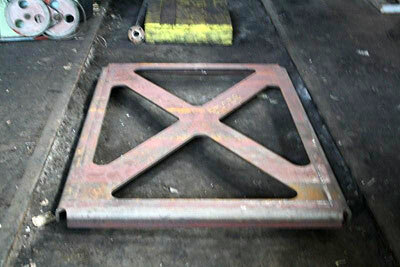 The arrival of two vertical stretchers from Dave Hewson and a large consignment from Accurate Section Benders, means that we now have all necessary frame stretching items with the exception of the firebox support bracket, the pattern for which awaits casting. This is not due to lack of finance but rather reflects the speed of progress over the past months: with three machinists and two welders on the go, we have a large number of components to keep us very busy into the New Year. The front buffer beam and its associated brackets will be refitted once the painting of all the bits has reached a certain stage. The procedure will be repeated for the rear buffer beam. Work is well advanced on the stiffening channels for the buffer beams. Another horizontal stretcher is awaiting fitting immediately to the rear of the brake cylinder support stretcher. Weather permitting, it is hoped to do this in the first week of the New Year. There has been good progress by welder Phil Harvey with the two radial arm support stretchers, and further work is queuing up for him with the delivery of the shaped steel for fabricating the two pony truck centre support stretchers! The close of the year sees excellent progress with the project, and we look forward to continuing this in 2010. We are very reluctant to make extravagant claims, but feel confident that the coming year will see completion of the frame assembly, including the smokebox saddle and front and rear buffer and dragbox assemblies, which should make for an eyecatching piece of locomotive. We can then press on with the next stage of building 82045 - that of creating a wheeled chassis which can be moved around the site at Bridgnorth without the need for a crane. The sharp-eyed may have noted a reference to the project in an article in the latest issue of Heritage Railway magazine about the award of the contract by the Talyllyn Railway to the SVR to build Dolgoch's new boiler. Although we have not discussed in detail with the Valley the possibility of having the boiler for 82045 built at Bridgnorth, we have always hoped to have as much as possible of the loco constructed "in-house" and were pleased to note this reference. Let's hope it isn't too long before we are able to place this final, definitive order. The signs are all good, so please continue to support us. Finally, may we wish our friends, supporters and readers all the very best for the coming New Year. We couldn't do this without your moral and financial backing - please keep them both coming, so that this most practical and needed of new loco builds is earning its keep as soon as possible! One of the newly arrived stretchers. 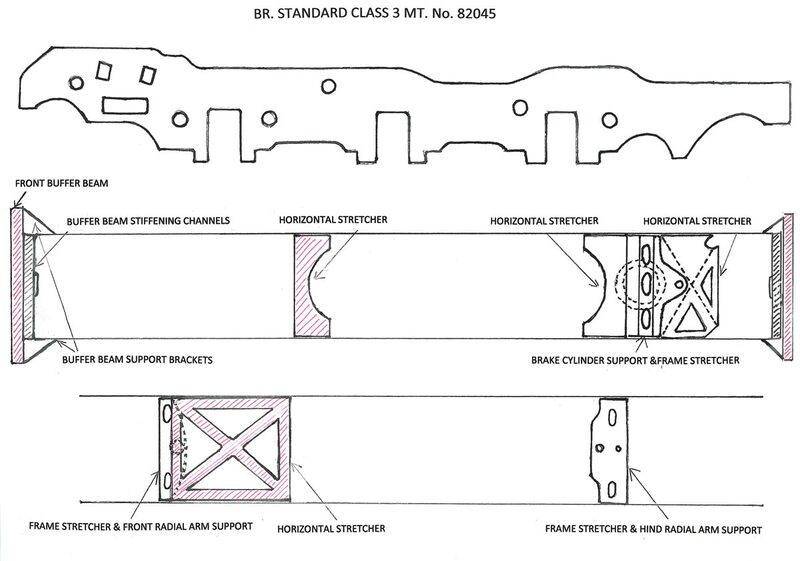 This horizontal stretcher is shown on the drawing below. Another of the recent stretcher delivery - pony truck centre/frame stay. 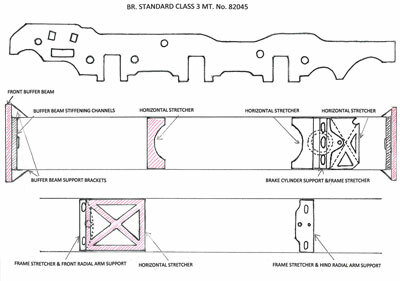 With so much work going into producing the various frame stretchers, we thought this sketch may help to show where these are located on the frames. First is a side elevation of the frames, with the front of the loco towards the left. The centre drawing shows the stretchers already in place on the frames and the lower one where the next three will go. The red hatching indicates the colour scheme! Click the image to open a larger version.